There "pre-earnings optimism phenomenon" has been well documented by Capital Market Laboratories and how is it has spanned both this bull market, and the Great Recession, before it. But Alphabet Inc (NASDAQ:GOOGL) has momentum pattern that superseded even that phenomenon and it has persisted for a long time and takes a little patience. There is no confirmed earnings date for Alphabet Inc yet, but Wall Street Horizon puts the unconfirmed date at 2018-07-23. 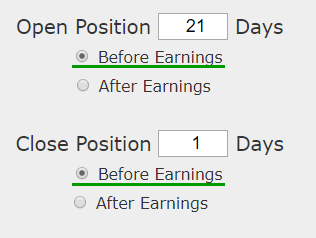 Let's look at the historical results of buying a monthly out of the money (30 delta) call option in Alphabet Inc 21 calendar days and selling the call before the earnings announcement. We note the use of a 30 day option so not to face total time decay on the options. We see a 2165% historical return, testing this over the last 12 earnings dates in Alphabet Inc.
We can also see that this strategy hasn't been a winner all the time, rather it has won 11 times and lost 1 time, for a 91.7% win-rate. ➡ The average percent return per trade was 108.4% over each 21-day period. ➡ The average percent return per winning trade was 121.4% over each 21-day period. ➡ The percent return for the losing trade was -34.6% over the 21-day period.